HomeGeneralCount down has really begun!! With the end of the year and ‘silly season’ fast approaching where are we The GG’s with their prep and organising you might well ask. Our lovely home has just gone on the market for rental to start when we go in January 2016. Not the best of timing as generally you would imagine that people especially families would want to be in before Christmas and not at the very start of the New Year. But we have it marketed with professional estates agents and so we’ll see. As ever, relatives are close to hand in case we do have to vacate before Christmas and as Christmas dinner is at theirs then that might not be such a bad idea. Lots done and more to do- packing has been endless so it seems- how many plates and glasses do you need and have!. Plus ebay is not proving to be a good a source of income as we hoped or perhaps just no one likes our stuff. Lots of more of technical bits to be done as well- Gas Certificates, EPC, permission to let to name but a few. Plus for us this rental income will form the base of our budget to travel for next year so we have to get it right! We are both now on notice with our relevant employers and our replacements have started, so more than a little odd handing over to them. So big changes for us and indeed our employers, but after 10 years for each and all of us we are leaving on good terms. We wish the new ‘David’s and Karen’s’ all the best for their future, and hope all parties involved have the same wonderful work experiences we have had. When we return then who knows, we and the world will be different for sure. One thing is certain and that’s is that retirement is not an option for us – too young and we will need to replenish our savings. Our new home on wheels has been viewed by us a couple of times now and it’s lovely we think. 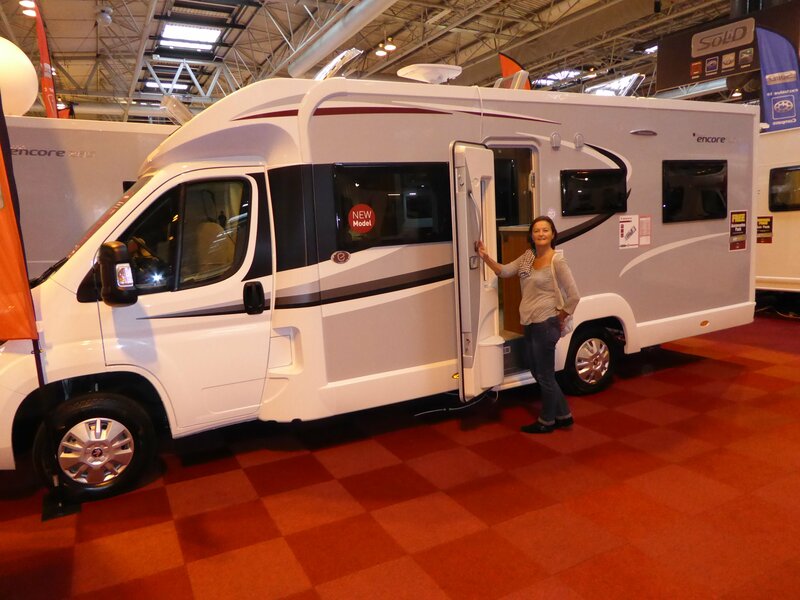 We meet up again with Elddis and the team at the NEC –Motorhome and Caravan show 2015 and had a good ‘nose’ at the van there. The Elddis team and stand was amazing and we can only begin to imagine the work that went into preparing for it and at it. We went with the intention of ‘shopping’ for our trip– Yes having put lots of house stuff in storage we now need to buy more stuff for the van- light and specialist for motor homing. A whole world of consumables to be had as you might imagine. We were good and adopted a ‘Think Once, think Twice’ approach before we brought anything- especially for those gadgets that look so good and then end up in the cupboard. That said we did invest in two electric bikes from RooDog EBikes, Scott was very helpful and had us sold on them. As we need some local transport to get around when we don’t want the 28′ van with us, these are ideal with up to 35 Km range as well as pedals. In a motorhome for a year we can’t afford for those mistakes and so we are still researching a lot of goodies and are making a wish list on Amazon. This we hope will help with Christmas pressie’s should any friends and relatives wish and want to buy us any, because we really don’t want 6 copies of Cooking recipes for a Motorhome, not that we wish to sound ungrateful! So we have a very special list for Santa this year. Still a WIP- work in progress is the route, we know we are heading straight to the south to try and get some warmer weather especially as a cold winter is being predicted for us this year. We have a lot of the relevant books for camp sites and joined the Caravan club but a precise route is yet to be confirmed, but don’t worry for all of you who are coming out to see us, we’ll get it sorted and at the end of the day, as we are told but yet to find out -the roads in Spain are good and by London comparison traffic free so we can always zig and zag accordingly. ¿Cómo son las clases de español van…………… You might well ask. Ok, we think although I’m sure we are trying the patience of our wonderful teacher Lola, pero we are progressing y with a few more semanas to go we might be able to get a copa de vino or una cerveza!!! For all those website professionals out there who might well be cringing at this website than we or rather David (the mainstay doing it) have to confess that it’s much more involved than we might have first thought- so stick with us as we progress and improve. This goes along with the quality of the writing and Karen’s social media skills, which are still very much at the ‘who are all these people on Facebook’ level. We will get better…………………. That’s all for now folks –whoops Karen just fallen under another pile of plates and glasses. Paul and Andrea, our plan is ‘loose’ as well, it is just having taken a year out before and the house rental part went really badly, we are being somewhat much more careful on that front. Part of the plan is to be relaxed and essentially we go up to Elddis and pick up the van turn around and head off to Spain, so that part for us, is guesswork! A lot of Fun but guesswork! Thanks for the support we are enjoying your preparations on your site. Peter, Supportive as ever! !love you too. Hope all is well. Great and informative update. Wishing you the best of luck with the traveling and having to be with each other in such close proximity for a year! !